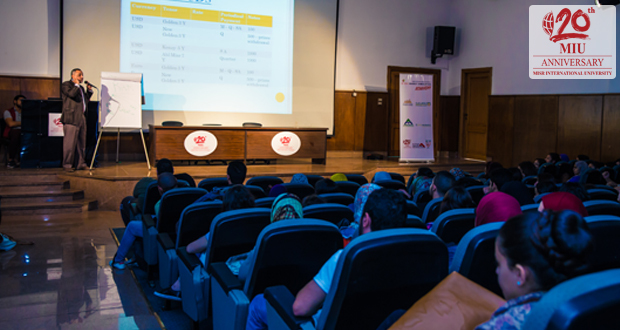 Misr International University encourages its students to find the right path for their futures and provides the students with a suitable atmosphere to be exposed to the work field. 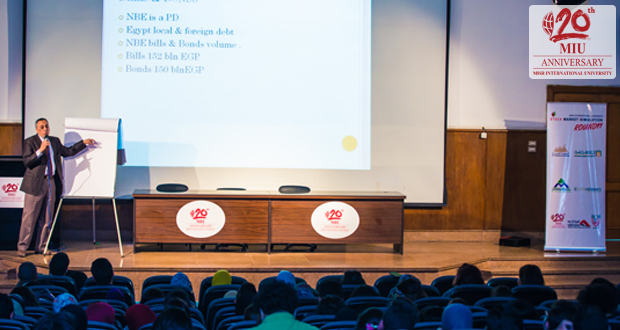 Thus, a session entitled “The foreign currency certificate of deposits” was held to increase 200 students’ awareness of the Egyptian economy and how the National Bank of Egypt and Banque Misr are trying to react to the continuing devaluation of the Egyptian currency from year 2011 to year 2016. Mr. Housam A. Zahran, Manager of Derivatives and Treasury Corporate Sales, NBE, presented the session on the 4th of April, 2016. This session is one of series sessions organized by Stock Market Simulation in MIU.